BELLEVILLE – Water Month is making waves across local schools this October. This month is part of an initiative paired with the Healthy Kids Community Challenge  in Hastings and Prince Edward counties. Part of the challenge is asking schools to, “take a pledge to promote the heath and support the environment of students and staff within their school for the year,” said Emma Pillsworth, the local project manager for the organization. Participating schools are given posters like this one to put up in the halls to help motivate kids to take part. Thirty out of the 67 schools (over 7, 500 students) in the counties have taken the pledge. Since it was only launched a year ago, Pillsworth calls that an impressive turnout. “We’re pretty happy with it,” she said. The Healthy Kids Challenge themes change every nine months and span over the entire academic year. The current theme, Water Does Wonders , is the second one being promoted across local schools, with October acting as its kickoff month. The organization’s first theme was Run. Jump. Play. Every day , which encouraged daily physical activity. Schools across Hastings and Prince Edward counties are throwing launch parties this week to let students and staff know what the month is all about. These parties will show an information video  and have tasting booths set up with natural flavouring choices like fruit and herbs. “Our overall goal is to get kids to drink more water. 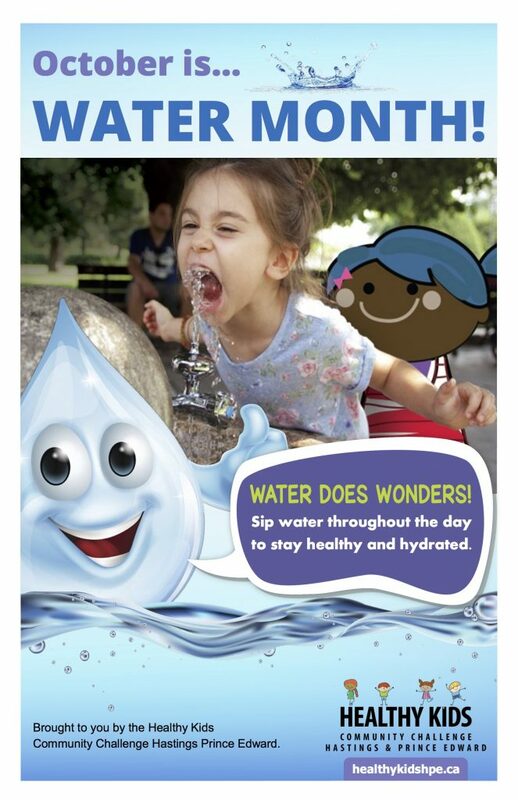 We know water is the best choice for kids to stay healthy and hydrated so we’re promoting that as our key message within the month, and trying to reduce the number of sugary sweetened beverages that kids are consuming,” Pillsworth said. “Every student, regardless of whether or not their school has taken the pledge, will be receiving a free Water Does Wonders water bottle,” Pillsworth explained. The water bottle will come with a bookmark as well as a recipe cards for naturally flavoured water. In Stirling Public School , students are challenged to use the water bottles that they received at the start of water month everyday at school. Principal Suzanne Cholasta said that the ultimate goal is to make water the drink of choice. “Any campaign that promotes the health and well-being of our children is worth our time and energy” said Terri Kirkey, a teacher who is organizing water month activities at the school. Kirkey is talking to her students in class about the importance of drinking water as part of a healthy lifestyle. The school is also hosting a launch party to inform students of the importance of water as an alternative to other sugary drinks. Many schools in the community are sending in application forms for filtered water stations. The application process will be closed this Friday. By Oct. 31, applicants will receive word about their application and final approval will come from the province. Stirling Public School is among the schools that have applied for one of the water stations. “We hope to be able to receive the fill station, it would benefit ourselves and the community,” said Cholasta. Six years ago, Ontario’s Ministry of Education created PPM 150 , a policy that requires all schools in the province to meet certain nutritional standards for the food and drinks sold within the school. This means that all publicly funded elementary schools in Ontario aren’t allowed to have vending machines that sell candy or pop. Pillsworth mentioned that school staff can’t police what students bring to school in their lunches, but can encourage the consumption of water over other products. “You still have to give people options and it’s okay to have things like that once in a while, it’s just that we’re trying to avoid it being an everyday occurrence,” Pillsworth explained. According to Statistics Canada, sugary drinks make up almost half of a child’s daily sugar intake. The human body is 60 per cent water. Being properly hydrated affects a person’s energy levels and brain function, which means that being dehydrated can impair how we think and act. Dehydration can also impair memory and concentration while increasing things like irritability and anxiety, according to Health Canada. Canada’s Food Guide  doesn’t suggest a specific daily water intake because different lifestyles call for different amounts of hydration. The guide recommends that water be consumed throughout the day, especially by young children such as those targeted with the Water Month initiative.